Lockheed Martin Space Systems Company has been contracted by the Jet Propulsion Laboratory to conduct a study on a low-mass membrane telescope for NASA's New Millennium Program. The telescope concept is called DART, for Dual Anamorphic Reflector Telescope. The study will be conducted at Missiles & Space Operations in Sunnyvale, the company's Advanced Technology Center in Palo Alto, and the Jet Propulsion Laboratory (JPL) in Pasadena. "We are very excited about working with Dr. Mark Dragovan, the developer of the DART concept, and Art Chmielewski, both of JPL, on this revolutionary technology for space applications in which Lockheed Martin has been involved," said Dr. Domenick Tenerelli, Lockheed Martin project director for the DART study. "Our past and present efforts on the Hubble Space Telescope (HST), the Space Infrared Telescope Facility (SIRTF), and the Space Interferometry Mission (SIM) provide an experience base that complements the vision and advanced space technology development of JPL." The DART system under study consists of two parabolic-cylindrical trough-shaped reflectors oriented with respect to each other to produce a point focus. Since each reflector contains only a single simple curve, the mirrors can be formed by tensioning a reflective foil over a frame that has a parabolic contour along one axis. The use of an extremely low-mass membrane for the reflective surfaces would significantly reduce the weight (and mass) of the telescope. In traditional telescope architectures, the larger the aperture desired, the greater is the mass required for the optics support structure. Because the DART architecture uses a thin membrane for its reflectors, the density of the mirror does not increase with aperture size. In fact, with DART, as aperture increases the ratio of structure mass to reflector mass actually decreases. Historically, the lower the mass of an observatory the lower is its cost and the number of launch vehicles required to put multiple telescope systems in orbit. Using DART technology, telescopes with apertures of 15-25 meters in diameter will weigh a hundred times less than HST -- which carries a mirror of only 2.4 meters in diameter. Future observatories like the Single Aperture Far Infrared (SAFIR) facility, Life Finder, and Planet Imager become feasible with DART. This revolutionary new technology thus enables very large aperture space observatories to be placed in orbit at modest cost. The DART technology concept under study by the Lockheed Martin team is one of eight selected for development for future missions. 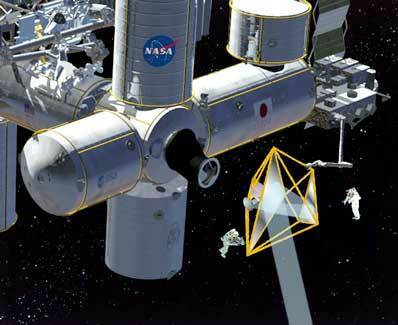 NASA plans to select up to five of the concepts for Space Technology 6 (ST6), the next New Millennium Program project, which will flight-test the new technology concepts in 2003 and 2004. The teams, selected by NASA's New Millennium Program, will study the options during a six-month phase for defining the technology concepts. The New Millennium Program was created in 1994 to identify, develop and flight-validate advanced technologies that can lower costs and enable critical performance of science missions in the 21st century. The program is managed by JPL for NASA's Office of Earth Science and Office of Space Science, Washington, DC. JPL is a division of the California Institute of Technology. Lockheed Martin Space Systems Company, headquartered in Denver, Colo., is one of the major operating units of Lockheed Martin Corporation. Space Systems designs, develops, tests, manufactures, and operates a variety of advanced technology systems for military, civil and commercial customers. Chief products include space launch and ground systems, remote sensing and communications satellites for commercial and government customers, advanced space observatories and interplanetary spacecraft, fleet ballistic missiles and missile defense systems.